‘GREATEST BRITISH COOKERY SCHOOL’ are accepted by over 25 ‘ICSA’ (Independent Cookery School Association) accredited cookery schools. The gift of learning, to inspire and share new skills and to help improve awareness of Great British produce. 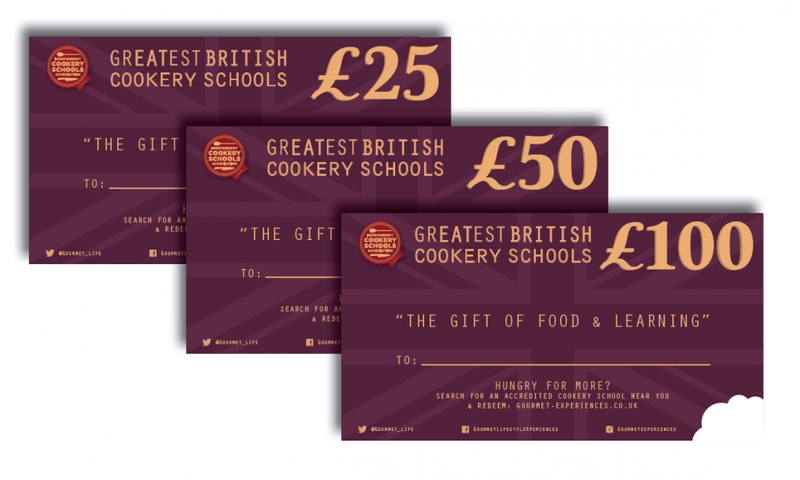 ‘GREATEST BRITISH COOKERY SCHOOL’ Gift vouchers accepted by all schools indicated here. PURCHASE PROCESS: Purchase your denomination below. Insert your ‘gift’ message. We will dispatch in either plain envelope OR gift box. RECIPIENT: Once gifted the lucky recipient simply follows the instructions to re-visit our dedicated redemptions page, choose their Accredited ICSA Cookery School UK wide, and contact us to redeem. Vouchers treated as cash towards any purchase, at any participating ICSA school. 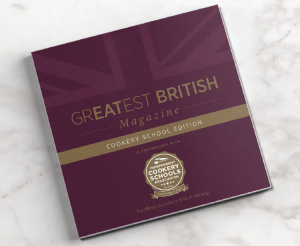 Order £100+ of Gift Vouchers and receive a FREE copy of the ‘GREATEST BRITISH COOKERY SCHOOLS GUIDE 2018/19′ . RRP £3. Featuring all participating ICSA Cookery Schools, and features from industry leaders including Raymond Blanc OBE, James Martin, and support from Prue Leith CBE and ICSA founder Stella West-Harling MBE. All “GREATEST BRITISH COOKERY SCHOOL” Gift vouchers are accepted by ICSA members subject to availability. Each can be redeemed towards any participating cookery courses or related purchases, as cash. No change given for part redemption. Valid for 12 months from purchase. Extensions available.